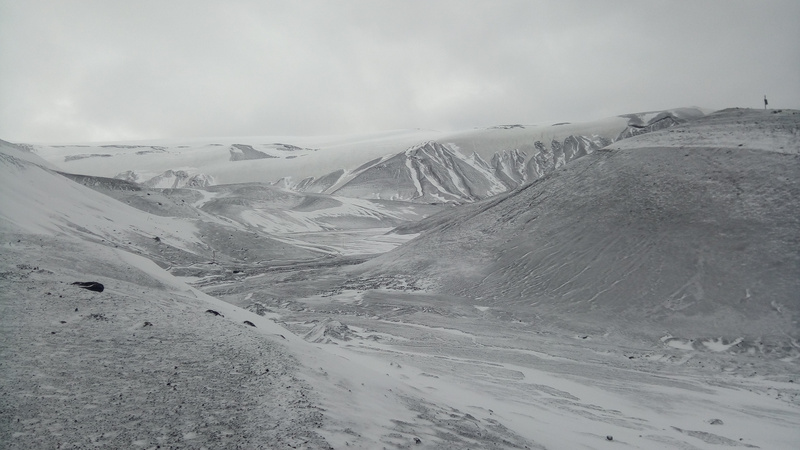 As you may know, between January 14 and February 18 I have been away from home on a research expedition to Antarctica. Several people have asked me for a post detailing my experiences, and I was also thinking to write at least something about the trip. I could spend pages talking about the amazing landscapes and fauna, or daily life in Antarctica. However, in keeping with the spirit of this blog, I will concentrate on the radio related aspects of the trip (and there are indeed enough to tell a story). If I see that there is much interest in other topics, I might be persuaded to run a Q&A post or something similar. Apparently, my trip and my posts in Twitter raised the attention of a few Hungarian Amateurs, who even discussed and followed my adventures in their Google group. Thanks to Janos Tolgyesi HG5APZ for his interest and for some good discussion over email during my voyage. On February 14, the Amateur transponders on Es’hail 2 (which now has the AMSAT designation QO-100) were inaugurated. Since then, two beacons are being transmitted by the groundstation in Doha (Qatar) through the narrowband transponder. These beacons mark the edges of the transponder. The lower beacon is CW, while the upper beacon is a 400baud BPSK beacon that uses the same format as the uncoded beacon of AO-40. I have already talked about the AO-40 uncoded beacon in an older post, including the technical details. As additional hints, I can say that for the best decoding, the beacon must be centred at 1.5kHz into the SSB passband. The centre of the signal is easy to spot because there is a null at the centre, due to the use of Manchester encoding. Frequency stability is somewhat important with this decoder, so if your LNB drifts too much you may run into problems. 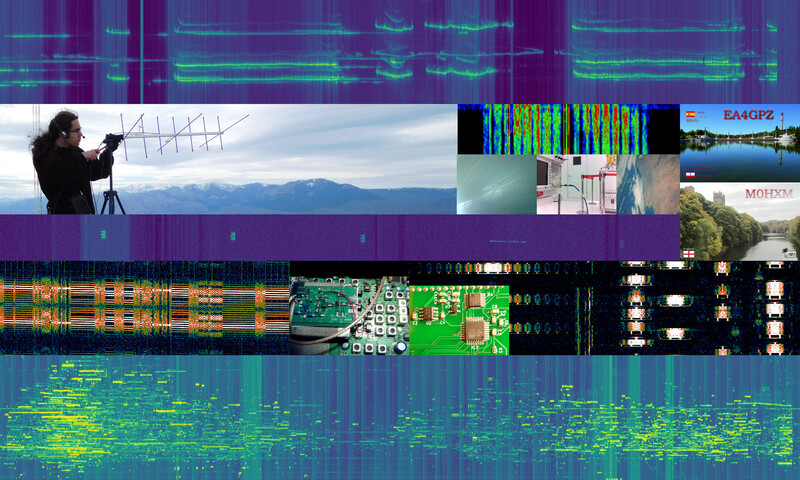 The SNR of the beacon over the transponder noise floor is rather high, so you should achieve a clean decoding unless you are using a very small station and you have the transponder noise way below your receiver noise floor. As you may know, I am on a scientific expedition in Antarctica until mid-February. Currently I am in the Spanish base Gabriel de Castilla, where we have relatively good satellite internet access. 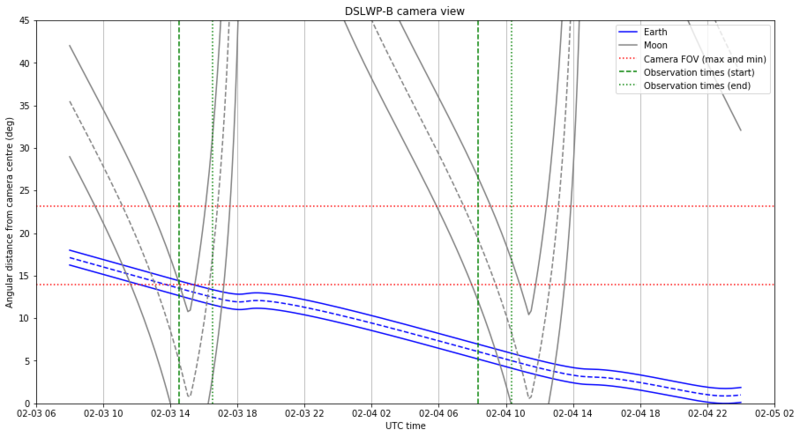 As I have some free time here, I have updated the DSLWP-B camera planning to reflect the upcoming observations announced by Wei Mingchuan BG2BHC on 2019-02-03 14:30 and 2019-02-04 08:20. As we can see in the figure below, the Earth will be very near to the centre of the image, since there is a new Moon on February 4 (recall that the DSLWP-B camera points away from the Sun, so the Earth is visible on the camera when there is a new Moon, as the Earth is then opposite to the Sun, as seen from the Moon). The observation times have been selected taking into account the orbit around the Moon, so that the Moon is also visible on the image. On February 3 the Moon should be completely visible inside the camera field of view. On the contrary, on February 4, the Moon will only be partially visible inside the frame. The figure below shows the angular distance between the centre of the Earth and the rim of the Moon. This kind of graph can be used to compute the times when the Earth crosses the Moon rim, allowing us to take an “Earthrise” image. 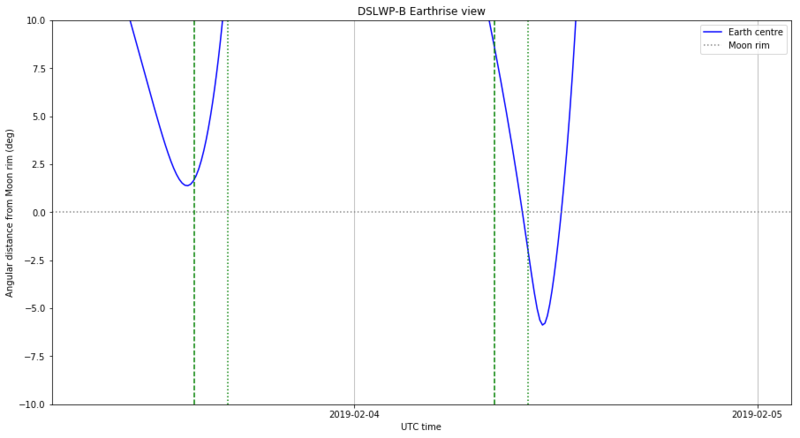 There is an Earthrise event on February 4, during the time when the Amateur payload is active. Generally, an image is taken whenever the Amateur payload powers up, but in this case it could be possible to command the payload manually to take an image near the Earthrise event. 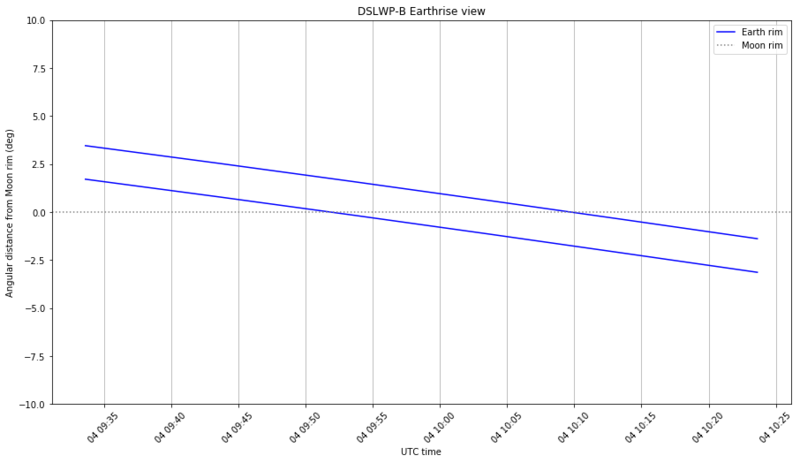 The figure below shows in detail the Earthrise event, with both edges of the Earth plotted. It seems that a good time to take the Earthrise image is on 2019-02-04 10:00 UTC.